As New York-based distribution house GKIDS continues to pick up and distribute some of the best and most ambitious family-friendly animation from around the world, one thing is becoming clear from looking at its library: Regardless of country, language, or culture, the idea of the quest movie remains compelling in animation, because it so clearly offers endless possibilities for changing environments, and gives animators plenty of variety to play with. Whether it’s a snippy talking feline journeying from 1920s Algeria to a fabled African Jerusalem in The Rabbi’s Cat or a sulky young Irish boy crossing the country trying to recover his selkie sister in the uncommonly beautiful Song Of The Sea, animation loves a nice expansive road trip. Even if there’s nothing much to say, there can still be plenty to look at. The bittersweet French-Belgian co-production Zarafa comes perilously close to “nothing to say,” given its mildly repetitive plot and focus more on miles crossed than character growth accomplished. But it’s stunningly beautiful nonetheless. Inspired by the story of the first giraffe to reach France, as an 1827 gift from Egyptian viceroy Mehemet Ali to King Charles X, Zarafa spends plenty of time on the road and in the air, exploring fabulously rich environments. And it also explores points of view not often seen in children’s films, especially American ones. That alone may be worth the price of admission. Zarafa opens with a pair of Sudanese children captured when white traders burn their villages and take them as slaves. Maki (Max Renaudin) escapes and winds up far from home, living among wild giraffes like an African translation of Julie Of The Wolves. 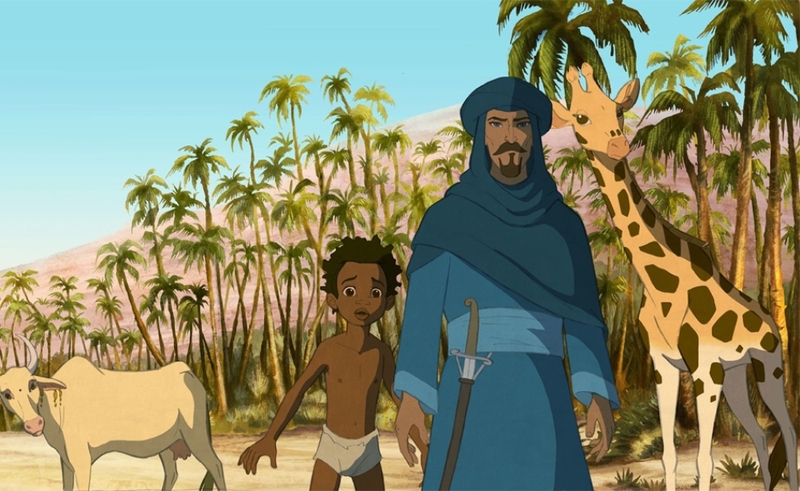 After a sequence reminiscent of the death of Bambi’s mother, but with the shooter onscreen and vindictively announcing his predatory intentions, Maki winds up traveling to Europe with an orphaned baby giraffe dubbed Zarafa, the stern but soft-hearted Egyptian traveler Hassan (Simon Abkarian), and the colorful explorer Malaterre (Francois-Xavier Maison). Hassan and Malaterre are out to deliver Zarafa to the French king as a gift, in hopes of securing his assistance for Alexandria, against a Turkish blockade. Maki only wants to bring Zarafa home to his native country, far from the bitter snows and decadent cities they have to endure en route. But on its own merits, Zarafa is more a feast for the eyes than the mind. First-time feature animator Rémi Bezançon (writer-director of the French romantic comedies Ma Vie En L’Air and The First Day Of The Rest Of My Life) co-wrote the script with Alexander Abela, whose previous credits are a pair of French Shakespeare adaptations; their story is high on incident, respect for Middle Eastern culture, and derision for French royalty, but also high on repetition, as Maki fruitlessly nags Hassan throughout the several legs of their long journey. Bezançon’s co-director, animator Jean-Christophe Lie, may be more responsible for the film’s look, given his history: assistant on several 1990s Disney animated movies, supervising animator on the stellar French adventure The Triplets Of Belleville, artist on Ocelot’s 2005 Kirikou sequel Kirikou And The Wild Beasts. All three influences meet in the look of Zarafa, which has highly Disney-esque 2-D character designs, Triplets’ deep color palette, and some of Kirikou’s setting. Zarafa is a stunning-looking film even when nothing much is happening: Just the beautiful rendering of the children’s African-village backdrop, or the spires of embattled Alexandria, make this film feel vast and weighty. And the region-influenced soundtrack, full of hypnotic drums and whispering woodwinds in the African scenes, but veering toward orchestral music as the journey approaches Europe, further deepens the film’s sense of feeling. Zarafa’s story is simple: Child and giraffe lose their parents, bond, and take an unwanted trip together. And it sometimes feels overstretched, in an attempt to pack enough silly setpieces or grim encounters into the story to hit feature-length. But the execution is stellar. Everything about the way this story is rendered makes it feel much bigger than the characters and their limited travails can make it.